MAHATMA GANDHI:- Mahatma Gandhi is the Father of the Nation. He fought for India’s freedom from British colonial rule. We owe our Independence and nationhood to Mahatma Gandhi. He lived by the principles of truth and non-violence. He practiced the high principles and noble virtues he preached. His lofty ideals are for us too to live by. He fought without resorting to violence and won India its Independence through the strength of his non-violent action. His initiative of using the charkha, a symbol of non-violence, to produce khadi was to create a self-reliant India. His life was an embodiment of simplicity and frugality. 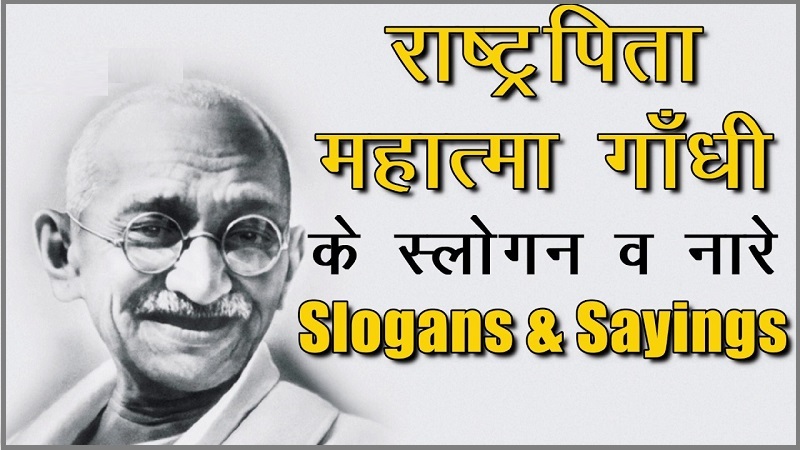 We have given below some unique, striking, and nice slogans on Mahatma Gandhi to help you on this occasion. Let’s respect the Father of the Nation, Mahatma Gandhi! We owe our nationhood to Mahatma Gandhi! 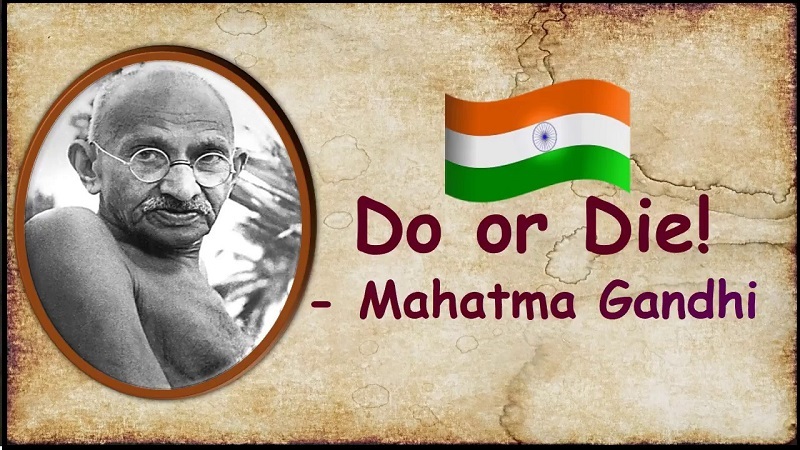 Say no to violence; let’s follow Mahatma Gandhi! Follow the path of ahimsa, it’s what Mahatma Gandhi did! Live by Mahatma Gandhi’s principles for peace and harmony! Truth and non-violence are powerful; let’s follow Mahatma Gandhi! Mahatma Gandhi lived by what he preached! Let’s follow the Father of the Nation! Let’s live by Mahatma Gandhi’s lofty principles! Let’s follow Mahatma Gandhi’s precepts for peace and harmony among all men! Let’s follow in the footsteps of Mahatma Gandhi! Use khadi; live by Mahatma Gandhi! Let’s honor the life of the Father of our Nation! Let Truth and Non-Violence lead our steps; let’s follow Mahatma Gandhi! If Mahatma Gandhi could, we too can! Let’s make Mahatma Gandhi proud of us! Let’s live by Mahatma Gandhi’s noble teachings! Mahatma Gandhi lived by Truth and Non-Violence; let’s follow him! Let us follow ahimsa, let us follow Mahatma Gandhi! Promote khadi; follow Mahatma Gandhi! Let Mahatma Gandhi’s noble principles be ours to follow too! 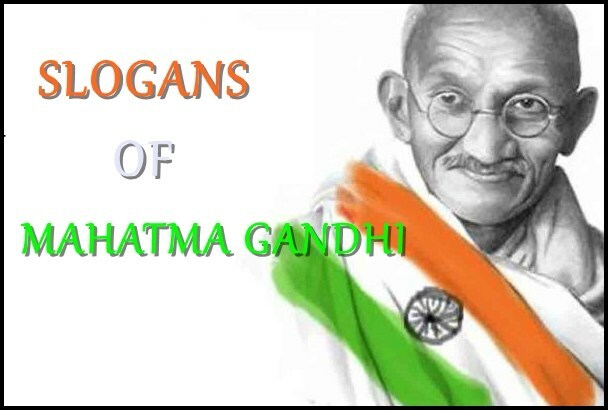 Let us follow Mahatma Gandhi for peace and harmony! Let’s live by Mahatma Gandhi’s principles of truth and ahimsa! Mahatma Gandhi was against untouchability! Mahatma Gandhi promoted khadi for creating a self-reliant India! Khadi was Mahatma Gandhi’s initiative; buy khadi! Mahatma Gandhi’s charkha was a symbol of non-violence! Spread Mahatma Gandhi’s message of peace and harmony! Mahatma Gandhi was an embodiment of truth and ahimsa! Let’s shun violence; let’s follow Mahatma Gandhi! Mahatma Gandhi lived by truth and ahimsa; let us too! Non-violence is a great power; Mahatma Gandhi lived by it! Cleanliness was an ideal for Mahatma Gandhi! Let us make cleanliness our national strength in line with Mahatma Gandhi’s dream! We owe our Independence to Mahatma Gandhi! Let us honor the Father of the Nation! Let us live by Mahatma Gandhi’s high ideals! Mahatma Gandhi’s ideas are as important today, let’s follow them! Mahatma Gandhi’s life epitomized truth and ahimsa, let’s make these virtues ours too! Let’s honor the memory of the Father of the Nation! We owe our freedom to Mahatma Gandhi! Mahatma Gandhi practiced what he preached; let us follow the Father of the Nation! Let’s follow Mahatma Gandhi in letter and spirit! Cleanliness and purity were principles Mahatma Gandhi lived by! A Clean India will be the coming true of Mahatma Gandhi’s dream! Mahatma Gandhi’s principles are eternal, let’s follow them! Mahatma Gandhi lived by his lofty ideals; let’s cherish our great Father of the Nation! Mahatma Gandhi fought for India’s freedom without any violence! Mahatma Gandhi followed the path of ahimsa; he never retaliated violence with violence! The life of Mahatma Gandhi is a testament to the power of non-violence! Mahatma Gandhi’s life is proof of the power of ahimsa! The power of truth and non-violence are exemplified by Mahatma Gandhi! Mahatma Gandhi’s virtues of truth and ahimsa are eternal!